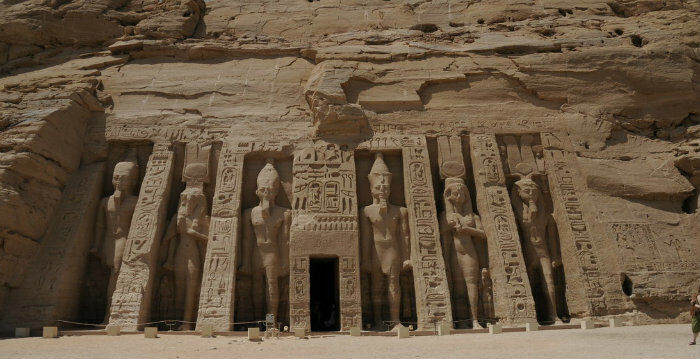 Book Abu Simbel Tour From Aswan. Air Trip to Abu Simbel By Flight to Ramsses II and His Wife Queen Nefertai. Private Escorted Abu Simbel Day Trip From Aswan Hotels or Nile Cruise With Personal Expert Egyptolgist Tour Guide. Get ready to be picked up early in the morning from your hotel or your cruise dock in Aswan then transfer to Aswan airport for half hour flight to Abu Simbel. Meet in Abu Simbel airport then transfer privately with your skilled Egyptolgist guide who will lead the way and give an indepth presentation to the history of the two famous temples of Ramses II & his wife Nefertari. He will tell you the story behind the temples including the big rescue process leaded by UNESCO to relocate the entire cliff face to a higher ground to protect it from rising water of Nile flood and how the amazing temples were discovered by pure accident in 1813 AD. Enjoy this 2 hours of sightseeing to both temples with enough time to explore in leisure then transfer back to Abu Simbel airport to fly to Aswan then to your hotel or cruise dock. Book Aswan Day Tour. Aswan City Tour to Visit Philae temple, the Unfinished Obelisk and the High Dam. Private Aswan Sightseeing Trips Depart Daily From All Aswan Hotels or Cruise Dock. Book Abu Simbel Tour From Aswan By Car. Road Trip to Abu Simbel Temples of Ramsses II and His Wife Queen Nefertai. Private Escorted Abu Simbel Day Trip From Aswan Hotels or Nile Cruise With Personal Expert Egyptolgist Tour Guide. Book Edfu & Temple of Kom Ombo Full Day Private Tour With Lunch. Enjoy Guided Kom Ombo and Edfu Tour to Visit Horus and Sobek Temples Privately From Aswan to Enrich Your Ancient Egypt Sightseeing While You Are Holidaying in Aswan Egypt. Book Luxor Private Full Day Tour Via Car With Lunch. Private Minivan Aswan Luxor Trip to Hatshebsut, Karnak Temples & Valley Of The Kings in Private Tour Aswan to Luxor by Car to Enrich Your Sightseeing Experience of Ancient Egypt.